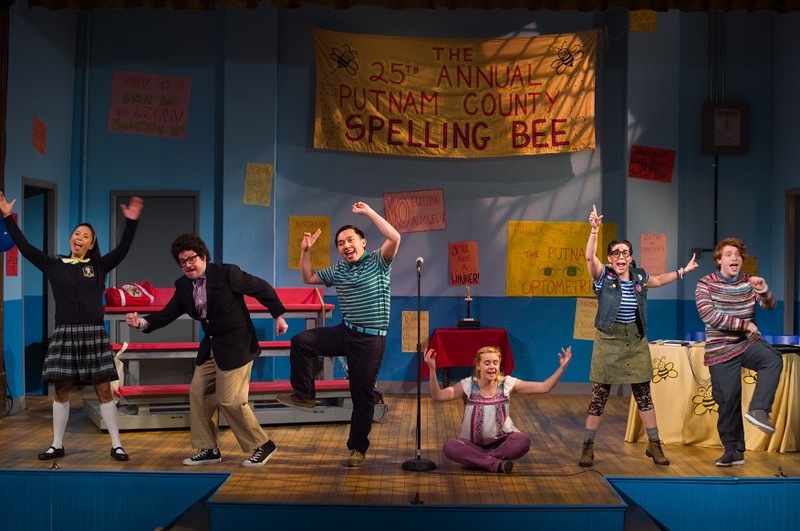 One of the most produced shows dominating theaters all over the USA is William Finn, Rachel Sheinkin, and Rebecca Feldman's The 25th Annual Putnam County Spelling Bee. After a fruitful New York run, the show has an immediate audience draw. Between colorful comedy, adult-lite comedy, audience participation, and a sugary score, Spelling Bee still finds its way into our hearts. But Finn's musical is written in a way where straying into originality and finding a unique personal spin can be immensely difficult. Such is the case in Astoria Performing Arts Center's production. The substance is there, the pieces were not. Presented by APAC, The 25th Annual Spelling Bee is a catchy musical comedy about a spelling bee featuring cartoonish youngsters with their eye on the ultimate prize. Infused with voluntary audience participation and some occasional improvised quips, Spelling Bee is formulaic. While it's not a carbon copy of the original, you can see where the freedom of interpretation can enter and where it is restricted. Director Dev Bondarin seemed to explore the piece through a realistic lens. She rarely deviated into the over-the-top comedy the text desperately desires. Bondarin seemed to hope that her adults would read as kids rather than allow the imagination discover it. And that's where the charm was lost. Heart was present, humor was not. The naturalism bled into the lights and scenic designs as well. Scenically, it worked wonders. Lighting wise, not so much. Scenic designer Tim McMath used the colors and architecture of the venue to inform the design. And it was seamless. When it came to lights, designer Adam Honore lacked lighting buttons on songs which in turn forced a lack of applause. And we all know actors feed off of the applause, especially in this format. Without audience recognition, the momentum stalled at numerous points. The costumes by Jennifer A. Jacob didn't quite have a whimsical flair. They felt safe. Each of Finn and Sheinkin's characters have a unique personality that didn't quite seem to be Jacob’'s intent. For example, when it comes to Leaf Coneybear, the text explicitly states he makes his own clothes. Jacob dressed Leaf in a multicolored sweater. By text's rules, it would mean Leaf knits and that's not truly in his character’s nature as he's not that smart. Big budget musicals on a smaller scale causes some natural restrictions. But some limits can’t be forgiven. One little thing can alter the entirety of a production. From voice to orchestration, the sound was thin and hurt the overall energy. With no personal microphones, relying on volume was near impossible. Had you not known the score, it’s possible you lost a lot. The other issue were the vocal flourishes that hurt diction. With many characters having vocal distinctions including lisps, clarity and audibility were gone out the window. The company of The 25th Annual Putnam County Spelling Bee was mediocre at best. Leading the bunch were Becca Andrews as Olive Ostrovsky and Lindsie VanWinkle as Rona Lisa Peretti. Andrews was sweet, sensitive, and sincere. Of all the spellers, you had to cheer on the underdog. VanWinkle was the only member of the cast who was able to use her vocal prowess to be heard. But beyond that, it was as if Rona Lisa Peretti was originally tailored made for her. There was a dryness to Matt Welsh’s Vice Principal Panch that worked. Next to VanWinkle, Welsh fell to the background but he did have his moments. With a direction that may not have served the overall production the best, many of the performances from the spellers suffered. As Marcy, Emily Borromeo was like a statue. There was no emotion even when she had her break out moment. Lee Slobotkin’s Leaf Coneybear fell flat. There was little personality to his “dumb kid”. The 25th Annual Putnam County Spelling Bee is an audience favorite. And there’s a reason why. But when the spark is lost, the show loses everything that makes it special. What I will remember most about this production was the improvised line about one of the audience speller’s being a member of the acapella group Young Adult Singular Sensations. The moment Lindsie VanWinkle said “YASS”, the audience erupted. It’s a shame the actual text never reached that peak.